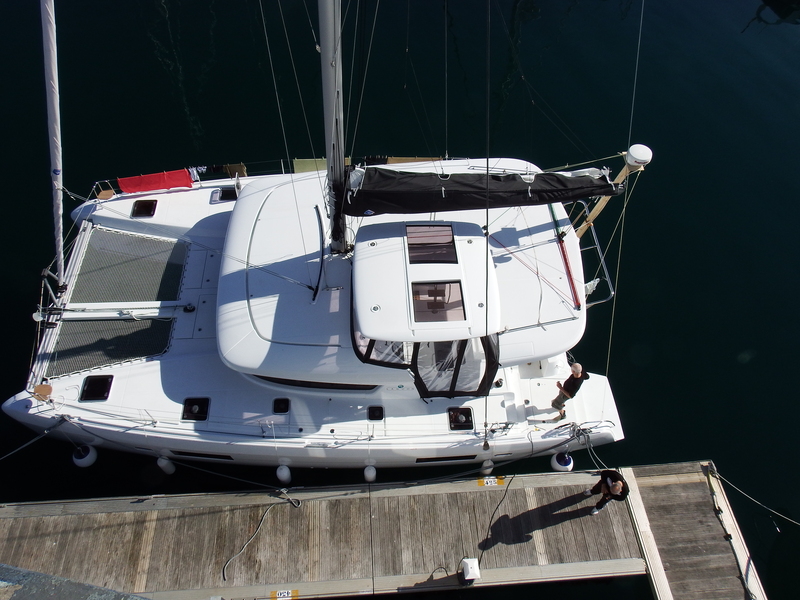 Follow the journey of our new Lagoon 42 as it travels from France to Croatia. 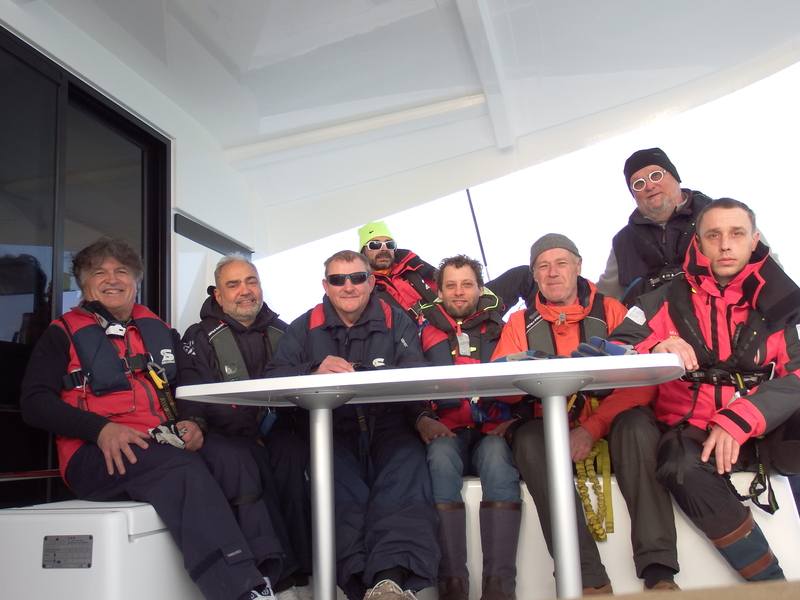 Read all about the interesting stories that happen to the crew along the way! We left Les Sables this morning at 9 am, an hour and half after high tide. Prior to that, we traveled two days from Graz, Austria, with a sleepover in Germany at our co-skipper´s house in a very packed car to Les Sables-d´Olonne. Then we worked a lot for four days to get the boat ready. Meanwhile, our crew arrived little by little. We are five Austrians, two Italians and one German. We mounted the radar and our active AIS. 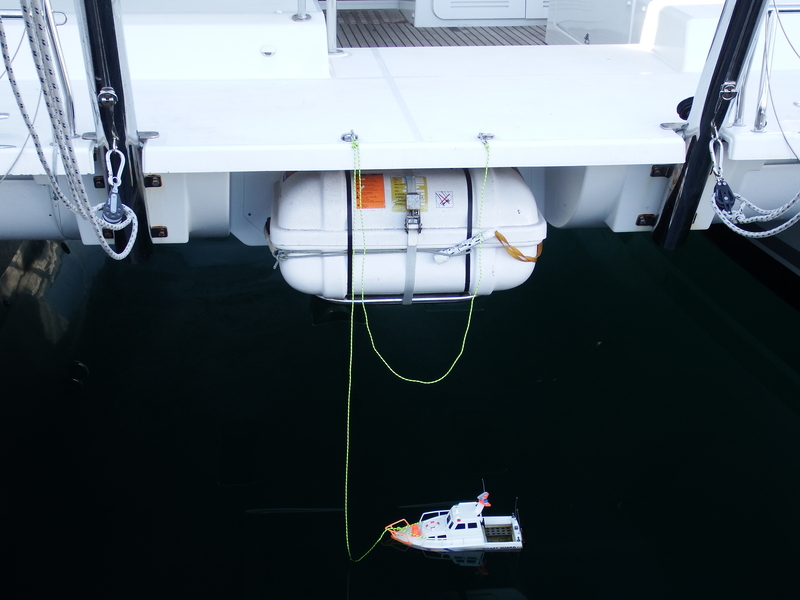 You can track our boat GALAPAGOS now via e.g. Marinetraffic. Our MMSI is 244060170. The weather was nice, but there were only seven knots of wind, so our starboard engine was running together with the sails. Both fishing lines were cast, and we hoped for a catch. The crew was working according to the watch system. At 4.20 pm, we saw up close a participant of the Vendée Globe „Trimtastic Flag“ on his way home to Les Sables. Later in the afternoon the wind decreased more, and we put away the jib, because we were running at the same speed as the wind. Five dolphins swam with us for a while. That brings luck. Our Italian friends made salad and spaghetti bolognese. The night was uneventful. In the morning, we got dense fog with visibility below 100 m. Luckily, we brought our own radar. It was working well, and we stopped the engine to be able to hear any fog signal. Around 1 pm, visibility cleared up to approx. 1000 m, and we switched the radar off. Also, we changed our course 20° to portside to have a better wind angle, and to be prepared for the expected wind shift to the right. Around 2 pm, the wind decreased, so we started the portside engine again, and got back to direct course to La Coruna. Günther prepared a big pot of chilli con carne and baked fresh bread. We found ourselves approximately 100 miles to La Coruna in the morning. We expected a wind shift to the north and increasing wind speed at noon, and hoped that we will be able to sail then. We changed our destination from La Coruna to Vigo, because with the expected north wind it would be difficult to go back out. Around 4.30 pm, we saw for the first time the Spanish coast. Risotto al funghi was the meal of the day. Since 11 pm last day we have been sailing without auxiliary engine. Around 11 am, we had to bind one reef. Maximum speed was up to 12 knots (surfing down the waves) with wind up to 25 knots. 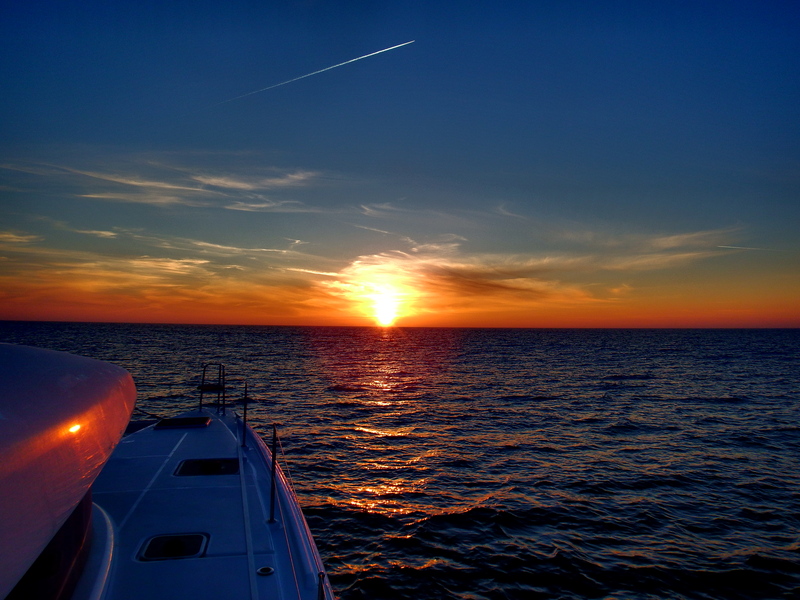 It was a perfect sailing day with sun and good wind. See was 3-4 degrees. At 5 pm, we rounded Cabo Finisterre. Everybody on board was enjoying this trip. 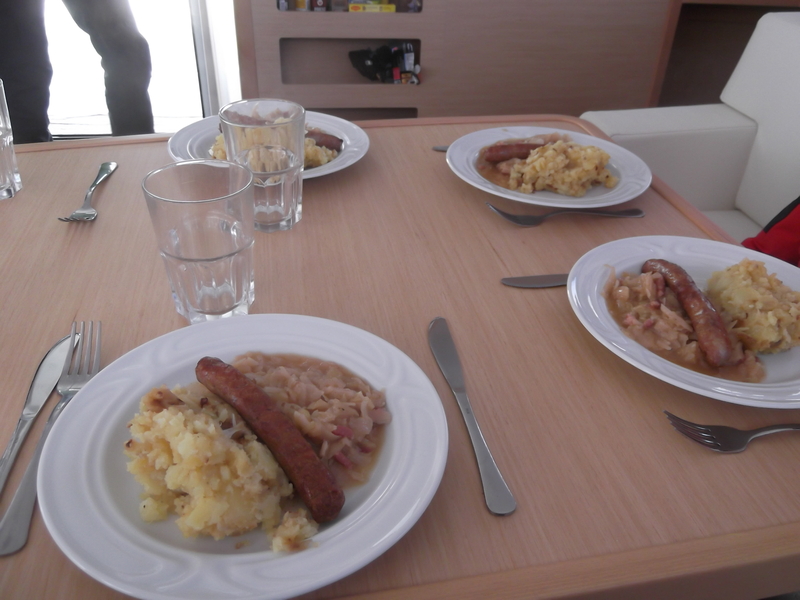 Today’s meal were roasted sausages with kraut and potatoes. Our stock of beer and wine was coming to an end, and although I don´t drink while the boat is moving, it was time to make a landfall. I was looking forward to a bottle of beer that evening in Vigo. The night approach to Vigo harbour was very interesting and tricky, but we were well prepared, so everything went smoothly. We arrived to Vigo Marina at 1 am, and actually found a bar which was open until 3.30 am to grab some beer. In the morning, everybody took a shower, and we got some provisions. 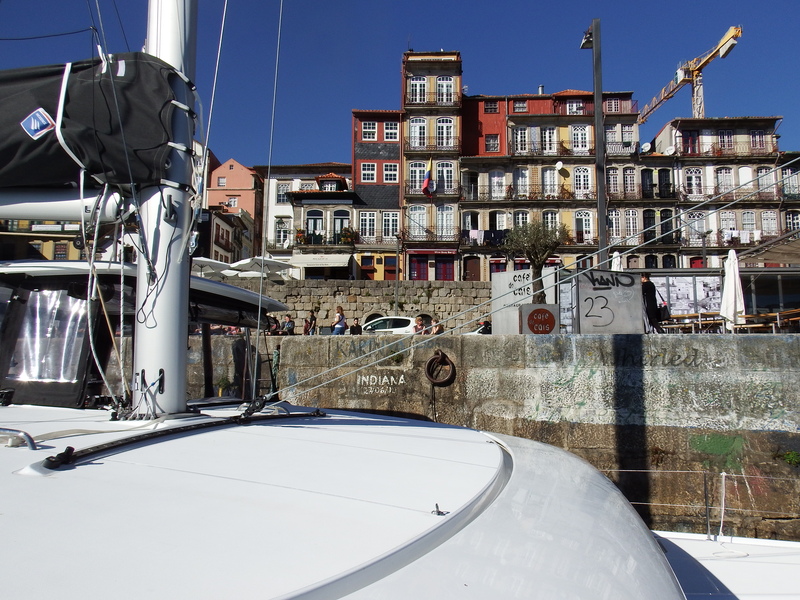 At 1 pm, we left Vigo Marina. We headed to Viano do Castelo in Portugal. Unfortunately, there wasn’t enough wind, so the portside engine was on duty. Nonetheless, it was a warm and sunny day. At 5.50 pm, we passed the sea border between Spain and Portugal, and changed the flags. 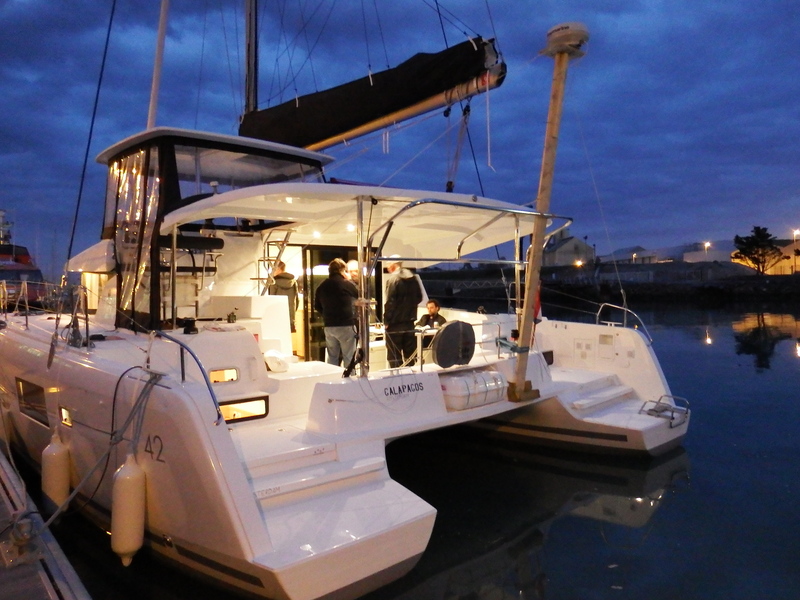 Five years ago, when we delivered first two catamarans, we found in Viano do Castelo a restaurant for locals, and enjoyed the food along with „vino tinto“ at very cheap prices. We wanted to check if that was still the case. And it was! Starters and fish for eight persons, 3 liters of wine and some beers for €69. In the marina we paid € 31, which is nothing for a catamaran this size. We were again impressed by the nice small old town, and will certainly come again. At 8 am, we left Viano do Castelo. It was still dark. In the morning, there wasn’t enough wind to sail, so again, the portside engine was working. It was a bright and sunny day. 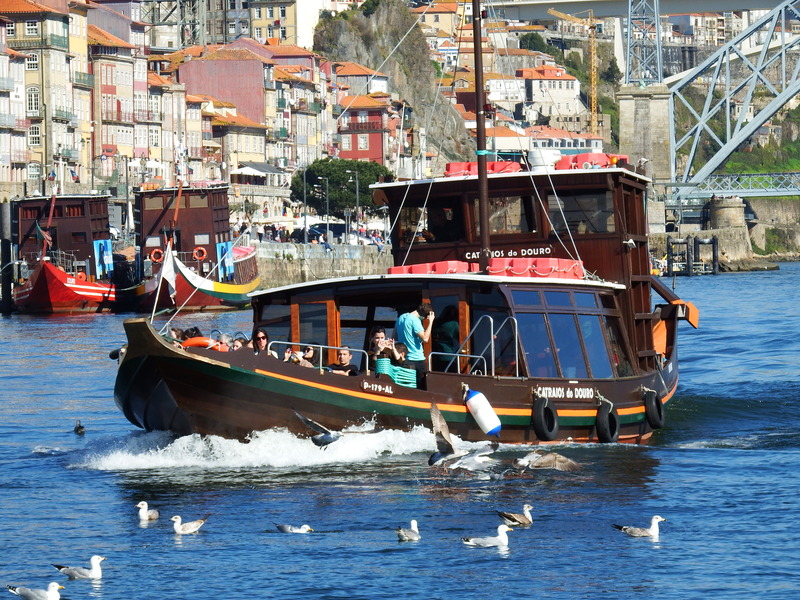 Around 2 pm, we steered in the river Doro towards Porto. It was my most impressive approach to a city so far. It was beautiful. 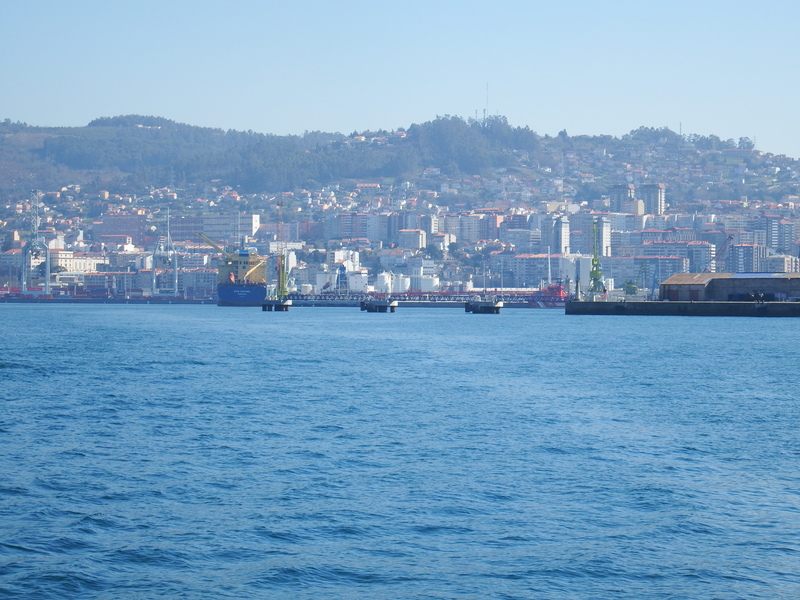 We moored up in the center on Cais da Estiva. In the afternoon, we went to the old town, and in the evening we had some port wine. Eine äußerst attraktive Crew! Vor allem der junge Mann ganz rechts! Blog ist fein zum Lesen und die Fotos sind schön. Ein paar Aufnahmen vom Innenleben des Bootes wären auch interessant.